Yeah, but: Cheap and common: bad in people, great in bags. The Long Version: I've owned this bag for at least a few years, and Mountain Equipment Co-op is still selling them for the same $21 that I paid all that time ago. The colours change from time to time, and now they're available in left and right-hand versions, but the design hasn't changed at all. It has a pocket on the strap that's big enough to hold a cell phone or a camera, a pouch on the side for a water bottle, a slash pocket running up the length of the pack, and the main compartment that's big enough to hold an SLR with a small lens on a large body or a large lens on a small body. Yes, when it comes to me and bags, it's all about the cameras that will fit in them. 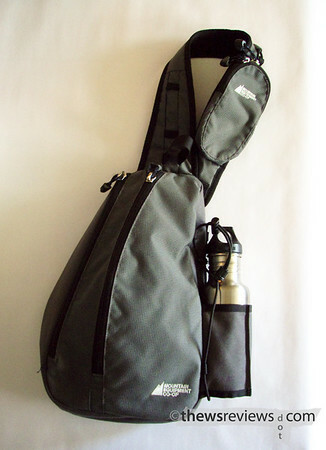 But this is a great all-purpose bag for people who don't carry cameras, too. It's a hands-free and gender-neutral purse that's easy to use, and it's cheap enough that if it only gets used occasionally it's not a major error. I have a larger Blurr bag that does a very similar job - except it will hold the E-1/E-3 with the 35-100 lens - but the MEC one is better made, better designed, and cheaper. It's hard to argue with that. Picked one up a week ago; see I did listen when you suggested it! It carries my Nikon 1 V1 effortlessly, with a second lens. It easily carries more than that. I was looking for an easy way to carry a mirror less camera and lenses...this is it! This fills a need for dog walking, and other errands. I'm glad you like it. This is the oldest bag that I have in frequent use – it's rarely put away in the closet – and it's still in excellent shape. If it wore out I'd consider it money well spent and immediately buy another, but so far it just refuses to give me any excuse.